Have you ever sat and wondered why a medieval packhorse bridge was built? If you have then you have my sympathies if not I suggest you don’t. I have been doing just that and I have some ideas but none of them seem to make that much sense. It could be said that most of the past 10 years have been spent trying to answer this question about another medieval packhorse bridge but I think I have an answer to that question – unfortunately the answer for this bridge doesn’t apply to the first bridge which I should find rewarding, and I do, but I just want to know why the first bridge was built as well. This brings me nicely to Ms Germanotta. I have been working on this portrait for a few hours now and the original is far from completed. However I decided to work on the image so far and came up with this which I think is actually quite good. So like my medieval bridge dilemma I have an answer but I am not sure it is the right one. 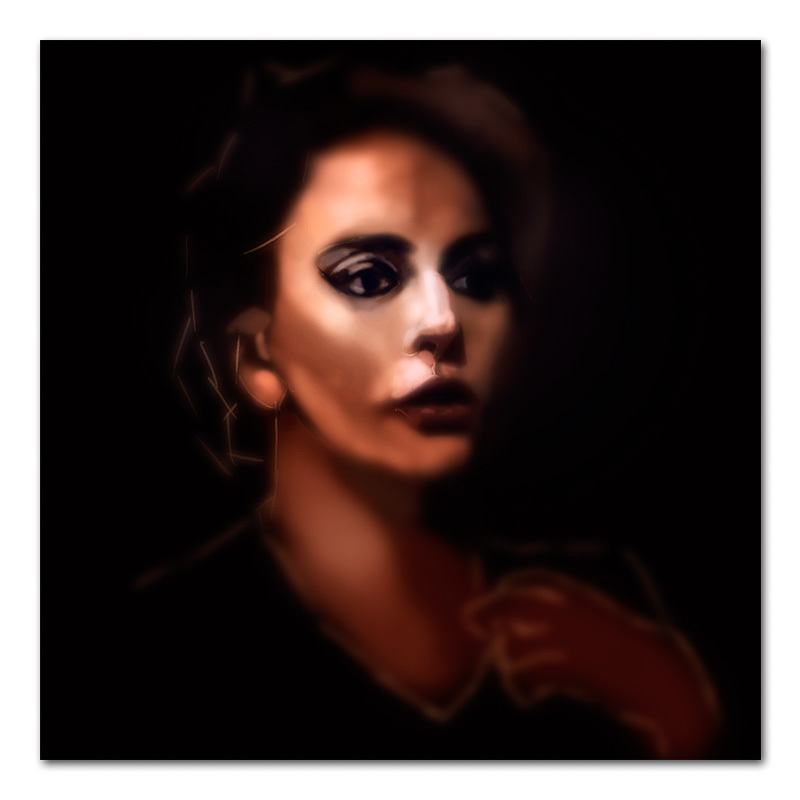 This entry was posted in Art, Digital Painting and tagged Digital Painting, Lady Gaga, Medieval Packhorse Bridge, photoshop, portrait, Stefani Joanne Angelina Germanotta, woman. Bookmark the permalink. Curiously enough, I have also wondered why packhorse bridges were built. Especially those still in existence crossing Rothley Brook in several places. It’s possible that local villages might well have decided to build the bridges themselves to provide an easy route to attract passing ‘traffic’ and ease local travel to markets. Perhaps packhorse drivers offered cheaper prices for villages building bridges? My thought experiment entails thinking what it was like to lead a string of heavily laden packhorses carrying high value loads (e.g. salt) through the countryside. (I understand Salt Ways are one of your interests). Strings of up to 40 packhorses were perhaps used, each carrying up to 240 lbs of salt in two panniers. And possibly coal on the return trip. From a practical point of view you wouldn’t want to lead 40 horses down a steepish river bank, across an uneven riverbed, and up another steepish riverbank (see examples at Anstey and Cropston). Firstly there is the difficulty and risk in getting horses to do this when strung together and heavily loaded, and secondly it takes extra time to do this, exposing the string to possible attack and theft. Especially if you have to take the horses across one at a time. Secondly you, the packhorse string ‘driver’ and your cudgel waving assistants, want to keep your own feet dry and able to respond quickly to any challenge on either side of the river. I think you would prefer the smoother, flatter, quicker, drier route. Strangely these are the two packhorse bridges I was thinking about. Both of the roads/lane/common ways (you pick) both lead to Leicester so it would be reasonable to assume that the traffic using the routes is in some way connected with the Borough of Leicester – but what trade would be sufficiently regular to warrant the constructions & maintenance of two bridges? As for the bridge between Cropston and Thurcaston the obvious material to be transported would be slate – however, given the weight of the material it is probably better transported on a cart of some description rather than on the back of a packhorse. If this were the case then it would seem most likely that the slate was transported across the Rothley plain to the Leicester Derby road into Leicester. Another possibility would be that this was a packhorse route between Leicester and Loughborough which is my favoured theory at the moment because otherwise the construction of the bridge doesn’t seem to make that much sense. As for the bridge at Anstey this would also seem to support a route into Leicester – however this time there is no real reason for its construction other than as a more direct route between Markfield and Leicester. The reason why I mention Markfield is because the medieval route between Whitwick and Leicester ran through here and so no doubt would have been used by packhorse trains plying between the two significant medieval centres. You mentioned coal and I don’t think that this was traded along either route for the following reasons: Coal is a bulky commodity and was probably traded between the coalfield at Swannington/Cole Orton along the established routes that ran through Bagworth, Ratby, Leicester. Whilst coal from this coalfield was traded in Loughborough it is doubtful whether this was then shipped on to Leicester via the probable route that ran through Thurcaston and down the Mowmacre Lane. Equally coal may have been carried down the Anstey/Gorsey lane route but there is no evidence to support this compared to significant evidence for the Bagworth et al route. As for salt by the Medieval period Leicester had well established trade routes with port of Boston which imported huge amounts of salt from Gascony, which in turn displaced the local salt pans/production centre, so it is unlikely that much salt, if any, came from the Cheshire wichs production area. Just to reinforce this point there were salters living in Barrow upon Soar in the 14th century which would suggest that they traded salt along the salt way to Boston. One final thought about tolls. During the Medieval period the up keep of roads/bridges was the responsibility of the Manors through which they ran. To pay for this upkeep local tolls were charged and it may well be that the tolls at Thurcaston were less than say Mountsorrel and so this meant that this was a cheaper route, even if it was slightly longer in length, than the main route between Leicester/Birstal/Wanlip/Rotherly/Mountsorrel/Loughborough – thus the increase in traffic and so the incentive to build the Sandham Bridge. After all after Swithland there wouldn’t be any tolls at all to pay until Loughborough. Anyway, thanks for this and it is a small world where two people can contemplate the same curious question. Arguably there are two packhorse bridges at Anstey, the obvious one and King Williams Bridge in Sheepwash Lane, and there is the one between Cropston and Thurcaston… but I wonder how many others existed in the past. Some were probably made of wood – there was one at Rearsby (but not on Rothley Brook) – and have been replaced by ‘modern’ bridges, and some although made of stone have probably been replaced by wider modern bridges. ‘The modern’ bridge at the foot of Blood Hill in Kirby Muxloe strikes me as a possible. Allegedly there were 7 mills on Rothley Brook at one time; I know where several of them are/were but where are the others? Were they served by bridges, or fords, too? I agree that the ‘bulk’ route for coal probably went more directly to Leicester via bridges at Enderby and Aylestone, but I wonder if coal was also carried in smaller weight to heavy users outside Leicester such as smiths and brick/pottery makers, straight from the mines as it were. I agree that most domestic use in villages was probably burning wood rather than coal. Similarly I have wondered about salt ways for some time. There’s the East Coast to Woodhouse(?) route and the Wiches to Measham route but what happened in the gap between the two? Did enterprising long distance packhorse drivers pick up salt at the east coast sell it along the way to Charnwood, pick up other goods to transport westwards to the Wiches where they would pick up another load of salt and start back? I suspect that much of the ‘evidence’ no longer exists, but I am heartened by how persistent long distant routes are, even neolithic ones. But it is difficult for people of modern mindsets to truly understand the lives of people in earlier ages. I believe the King William bridge was built for the visit of King William, can’t remember which one either 3 or 4, to Bradgate so isn’t a packhorse bridge at all. It is an interesting question to ask just how many modern bridges were situated on the site of older bridges. I think to answer that question you have to answer two questions: First just how difficult is it to ford a river – do you need to build some form of bridge? Secondly, is there sufficient traffic to pay for the construction of a bridge? After all these bridges have to be paid for. It is not unusual for a packhorse bridge to be associated with a ford as well. Perhaps the best one I know of is the packhorse bridge at Aylestone. This is medieval in origin but there was clearly a ford there as well for heavier traffic – certainly in the 17th century as the huge cannon that Charles 1st used to breach the walls at Leicester must have crossed the Soar somewhere near Aylestone to get to its position somewhere near to Raw Dykes. The transportation of coal is an interesting question. The earliest records show that people went to the pitheads to buy their coal. In time this started to change into some form of organised transportation system whereby the coal was brought to the major markets and then sold. The use of packhorse trains to transport coal also seems to be a later development as the records from Nottingham show that people were taking carts out to the coal fields at Trowell and then bringing them back to Nottingham. These journeys were jointly funded so several people would have been supplied by the journey. It would appear that distance from the coal field may well have determined the use of packhorses as these are quicker means to transport coal than slower carts. This in turn would have increased the demand for bridges at spots where a river crossing was difficult in much the same way as bridges are built today. You mention the Aylestone and Enderby bridges and Leicester. The Enderby bridge didn’t support the coal trade for Leicester but rather that which flowed to south east Leicestershire. I am very dubious of whether Aylestone did either as it is a long detour to go to Leicester via Aylestone. There are records of coal traders camping in and around Braunstone park in 17th century before going to trade coal in Leicester the next day. As the modern Hinckley Road existed from at least the 13th century (or at least the route to Desford) then the most direct route to the Borough of Leicester from Braunstone Park is via this. The only reason why one might consider going via Aylestone is if the tolls at bridges in the modern west bridge area of Leicester were too excessive when compared to those at Aylestone. Because of this I think it is more likely that the Aylestone bridge supported the coal trade to Wigston and beyond although some connection with Leicester cannot be ruled out entirely. As for the salt way from Barrow to Boston v Cheshire salt ways I think it is important to put these into their chronological order. The salt ways that came out of Cheshire towards Leicestershire are undoubtedly prehistoric in origin whereas the Salt Way to Barrow are is Roman – at least 200 years younger. The area to the west of modern day Boston was a large Roman salt production site whose produce probably swamped the north Leicestershire market – with one saltway going directly to Roman town at Leicester. This probably squeezed the market for Cheshire salt in northern Leicestershire. However, the southern route into Leicestershire was probably reused by the Romans as a direct connection between the Fosse way and the Ryknild Street. There is evidence to suggest that this route was still in use during the Medieval period, although it is doubtful whether it was used for the transportation of too much salt but that is less clear. I think it is important when trying to understand why a particular route continues to exists is to accept one very simple fact: rivers, even quite small ones, are difficult to cross unless you want to get very wet. With this in mind places where it is easy to cross a river continue to be reused again and again and bridges are built and then replaced again and again. There are places in Leicestershire where, if the archaeological evidence is interpreted in a certain way, it is clear that river crossing have been the foci of human activity going back to the bronze age at least.